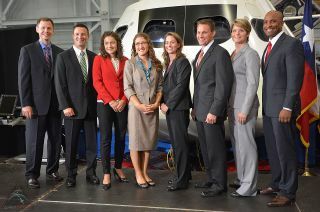 NASA's 2013 astronaut candidates, nicknamed the "Eight Balls," pause for a photo at the Johnson Space Center in Houston, Aug. 20, 2013 (from left to right): Tyler “Nick” Hague, Andrew Morgan, Jessica Meir, Christina Hammock, Nicole Mann, Josh Cassada, Anne McClain and Victor Glover. HOUSTON — The "8 Balls" have landed in NASA's center pocket. On Tuesday (Aug. 20), eight new astronaut candidates — nicknamed the "Eight Balls" — were formally welcomed to NASA's Johnson Space Center in Houston, where they're set to begin two years of basic training. "The new astronauts we're introducing today are critical to achieving our ambitious goals," Bolden added. "They will help us continue to lead the world in exploration, and they'll become role models for boys and girls, men and women, from all over the world. Their journey begins now and the nation, as it always has, will be right beside them reaching for the stars." Chosen in June from an applicant pool of more than 6,000, NASA's 21st astronaut class includes four men (Josh Cassada, Victor Glover, Nick Hague and Andrew Morgan) and four women (Christina Hammock, Nicole Mann, Anne McClain and Jessica Meir). "These next generation American astronauts will...have an opportunity to fly on new commercial space transportation systems that are now under development," Bolden said. "More importantly, they will be among those who plan and perhaps carry out first-ever human missions to an asteroid and on to Mars." "Of course, it all begins with preparing them for missions to the International Space Station," he said. Following a long-standing NASA tradition, the "Eight Balls" received their nickname from the prior class of astronauts, "The Chumps" selected in 2009, who are now beginning to receive their first assignments to fly to the space station. "The eight ball [in billiards or pool] is played last, and the hope from the preceding class is that the [2013 astronaut candidates] will be assigned after all of them [fly]," Bob Behnken, chief of the Astronaut Office at Johnson Space Center, told collectSPACE.com. It will be two years at the minimum before any member of the "Eight Balls" will be eligible for a mission assignment. First, they must undergo basic training. "The eight of them will go through a wide range of new training opportunities," Behnken said. "Some of them will have some familiarity based on their prior military training, but the space business is new to all of them, so I think they are going to have an exciting time." The training will involve three primary activities. The astronaut candidates, or "ascans," will be instructed on the technical aspects of living and working aboard the space station. They'll also tour NASA's facilities across the country, "so that the class as a whole will have a good understanding of all the things that go into making NASA as successful as it is," Behnken said. First, though, they will be given flight training at the nearby Ellington Field in Houston and, for some, at the Naval Air Station in Pensacola, Fla., as well. "They will also have T-38 [supersonic jet] training, where those who already have an aviation background will hone their skills in the T-38 and those who do not will have the opportunity to get that aviation background under their belt before they start supporting crews who are on orbit," Behnken said. "Our biggest responsibility is to learn from all these people around us, from years and years of the history at NASA, so when the baton is passed on to us, we are ready to go forward," Anne McClain told collectSPACE. Perhaps distinguishing the "Eight Balls" from the previous ascans is the open nature of their path forward. At the same time they were being welcomed, NASA and 11 other international space agencies released a "Global Exploration Roadmap," setting a united but generic vision for robotic and human missions to near-Earth asteroids, the moon and Mars. The roadmap identifies the locations the agencies want to pursue but doesn't define the shape that the missions to reach those targets will take. "We are wide-eyed and we are open," Nicole Mann said. "We all have a diverse background. We are ready to learn and train for whatever mission that NASA puts forth for us." Click through to collectSPACE.com to see more photos of NASA’s 2013 astronaut class, the "8 Balls."